I frequently see many fashionable, young ladies walking around and sometimes have to stop them dead in their tracks and ask, "Where did you get that?!" I always hope they give me a brand or store they bought it from and not tell me it's their grandma's or it's vintage. What a buzzkill. The cherry on top is if what I'm gawking at is described as "...sooooo comfortable." Now you've got my attention! I'm the girl that is always tugging and pulling and swearing that everything I own has an itchy label. My pile of unworn, toe pinching shoes is getting quite large. So my new(ish) rule is comfort over everything! Spending money on items I'll never wear is just tomfoolery. This outfit is a great example. I might as well be wearing pajamas it's so comfortable. Perfect rompers tend to do that. omg! i love this look!!! cool cape. I'm completely fan of your style dear ! 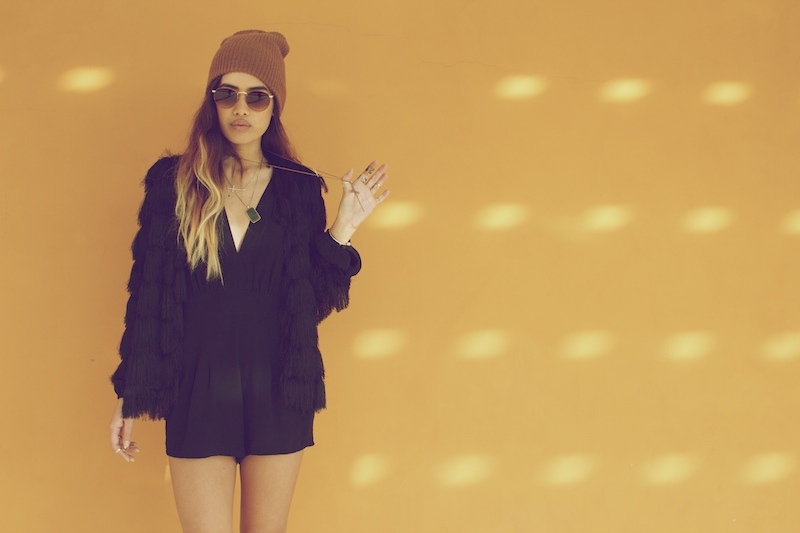 Love how you've styled the playsuit! You are so cute and your style is so cute. I like this so much. Your shoes is so fine. Woah I just found your blog and I love it! Adore your style girl. And speaking of "where did you get that? "...please tell me where you found that beanie? I love it! And most of all, let's not tear down other women. It's about time we started respecting our fellow female because this 'tearing another girl down to make yourself feel better' or 'having no girlcode' thing ain't cute. And personally I would never want to be the reason another woman doubted herself..
Samantha Pawlucy, the Charles Carroll High School student ridiculed by her geometry teacher for wearing a t daddy shirt shirt supporting Republican presidential nominee Mitt Romney, returns to school with plenty of support. Ronnie Polaneczky bears beets battlestar galactica shirt says the teacher should apologize and mean it. Christine Flowers says she's not a sloth shirt fan of anti bullying "hysteria" but sees the problem here.